Purr and Roar are back. Named after my original two button macro set, this works by casting “PURR” until you reach five combo points, then finishing with “ROAR.” I’ve had improved DPS results over my recent Simona and Mario set of macros. Regrowth is part of the macro set, but you could delete those three lines from Purr if you didn’t want Regrowth included. Having it included improves survivability. And while it doesn’t appear to use any energy while in cat form, it slows the use of energy down, which is not a bad thing. These macros do tend to run out of energy during prolonged encounters and so you will get an occasional “hang.” You can expect to wait for energy levels to rise enough to cast the next attack. 1. The addition of Moonfire with the Lunar Inspiration level 15 talent selection. DPS is improved when changing from the Predator level 15 talent. The macro set keeps Rip, Rake and Moonfire DOTs up continually. 2. Attacks are prioritized for better energy conservation. This minimizes the “hang” from low energy during prolonged encounters. It hasn’t seemed to affect DPS and I experienced an increase in DPS because you are casting more attacks over any given time. 3. Roar, the spender macro, now starts with Rip to get the bleeds started and up continually during an encounter. 1. For AOE situations, I like to spam Thrash and Brutal Slash. Thrash is expensive, energy wise (40,) so I have left it out of the macro. You could add /cast [combat] Thrash into the Purr macro if you want it included, but expect more hangs when spamming Purr. 2. As far as talents, the level 30 and the level 60 talents are optional. The other talents are necessary for the macro to work. 6. Talent setup is 3,#,1,#,3,2,3. I was remiss in including it in the original post. It is listed when you import the macro. I change the “#” talents depending upon the situation. I typically use Tiger Dash as the second talent as I like running flags in battleground. I use Typhoon in some battlegrounds with cliffs. There is something very satisfying in assaulting the flag after blowing someone off the cliff at lumber mill in Arathi Basin. Mass Entangling Roots is generally more usable in most situations though. 7. Removed Beserk from origninal macro as it gets replaced with Incarnation. Thanks Pacov for catching that. Test of the macro is now on YouTube. DPS topped out at nearly 10k, which isn’t typical. It normally tops out at around 3.6k. DPS is typically around 3k. I always test on this single target Raider’s Training Dummy in SW. Video shows location, gear and talents. *Note: this is the second test video. For whatever reason, I didn’t have any legendaries equipped for who knows how long. I’ve now equipped Behemoth Headdress and Chatoyent Signet. ilvl is 241 with this gear. Nice one again, I always like using your purr and roar macros. When I checked, I didn’t have legendaries equipped! It’s probably been that way since the update. I’ve equipped Behemoth Headdress and Chatoyant Signet and my ilvl is 241. DPS is increased significantly now. Go figure. I’m using a Logitech G600 MMO mouse and it’s set at it’s default setting of 500ms. In the above YouTube video peak DPS hit 9,957 at one point. Looking back through the video, one attack registered 179,593 damage. What in the heck was this? I cleared the logs without looking as I hadn’t noticed it at the time. Anyone have any idea what that was? I think I’ll post this in the general forum as well. 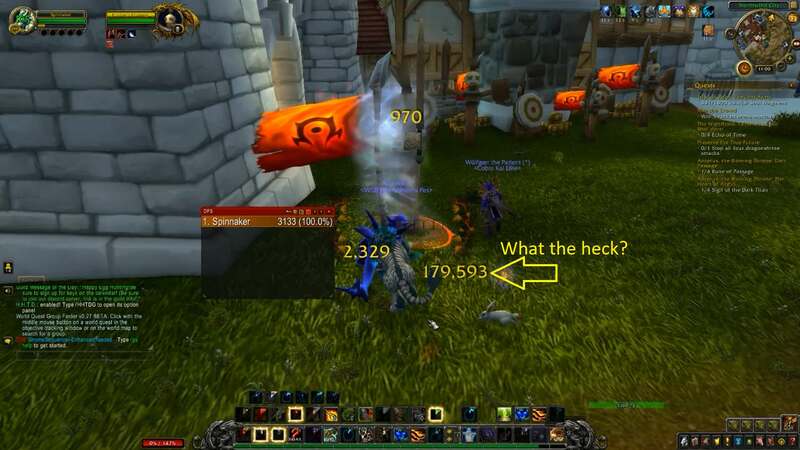 Sadly, the Stormwind dummy is plagued with rats and rabbits – looks like you hit a rabbit 🙂 These are far lower level so damage (and dps) spikes. With hugely careful positioning you can avoid the rat, or the only raider dummy I’ve found that doesn’t have ‘adds’ getting in the way is in Ironforge.